A postdoctoral student at the University of Lagos identified as Fatai Mutiu Abolade was crushed by a train along Ikeja railway line on Monday morning, while a yet to be identified final year student of LASU was crushed to death, today, around Ajayi Farm, Ikeja. According to Saharareporters, yesterday’s incident happened at about 7:30 am. 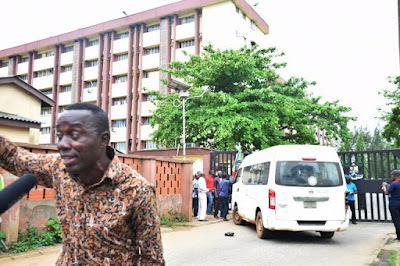 The identity card found on the man showed that he was studying Economics in UNILAG and had the matriculation number 119081228. According to eyewitnesses, Abolade and the final year students were on their phones, oblivious of their surrounding. It was gathered that the train was on full speed but on seeing the now dead Abolade, the driver kept honking and people around the railway were shouting to get Abolade’s attention but he was too distracted by his phone. “He was looking into his phone and pressing it. The train was honking but he did not hear. People were also shouting, he just checking his phone. By the time he raised his head up, he was already hit by the railway. There was no how he could have survived it” one of the eyewitnesses said. While some said Abolade had earphones on, others said he was checking his phone but had no earphone plugged into his ears. Strangely, his phone was stolen immediately the accident happened. Sympathizers who wanted to check his phone contact so they can notify his relatives could not find his phone.